If I'm not wrong the Russian Armed Forces do its own tests before to adopt a new design of material. First own tests in the factory, later tests of the Russian Armed Forces in order to adopt the weapon or not. This would be roughly the habitual procedure, and this vehicle seems to enter in the stage of testing with the Russian Armed Forces. But not totally clear even in the traslation. Armored vehicles K-53949 are designed to solve the problems of comprehensive provision of combined arms and special units, including peacekeeping forces, under various conditions. Can be used to transport personnel and cargo. The car has high combat and operational characteristics, high controllability, speed of movement and permeability to all types of roads. The multi-purpose armored car has protection against small arms and explosive devices. The platform of the vehicle is a universal base for the installation of various superstructures of security, reconnaissance, and fire support. The Factory tests are to ensure the vehicle is properly designed and assembled and that everything works to specification before being handed over the to customer. Of course when it is handed over the military needs to test it to make sure it does everything they specified for it to be able to do. After those tests they then need to put it into an operational unit to develop a training and operations manual for using the vehicle and a maintainence manual on how to look after the vehicle. Often a pilot batch are made for larger scale testing with normal troops... any problems found and they are sent back to the factory for fixes. The end result is a new vehicle in service. If Im not wrong, the tests of the Russian Armed Forces are serious, difficult to pass, and some material fails. One example of it would be just the first edition of the Typhoon 4x4, that returned to the factory. Under the modern testing standards of the Russian Armed Forces, this kind of small semiarmoured vehicles tend to have problems to meet the requiremens for safety of the crew in contested environments, but can work for roles of auxilary vehicle (utiity, trasport,...) outside of the frontline. But even in this case, Russia can not select all the alternatives, and only seletcs very few, in order to keep some degree of standardization. There is high competence, I will try to collect all the recent alternatives in one comment. Because of the different operating environments they have to have some flexibility too of course. The BMP was accepted as the standard IFV troop transport for example, but in some areas they were too heavy and their tracks were too narrow to operate in very deep snow or very deep mud. The solution was that some units used the lighter MTLB series of vehicles in the role with much lighter armament and armour, but with good mobility in bad conditions. When it is a new vehicle I doubt they have an idea of exactly what they want so when they offer up their specs for the new vehicle and a few companies put forward prototypes and they have a play with them they can then decide on what features are really useful and some that sound good but are not that useful in practise. An excellent example of this was early on in tank development with their BT series light tanks they had the feature of being able to run without tracks on wheels. In theory it sounds useful but in practise it was almost never used so that feature was removed and the design made simpler and cheaper. Once they have decided on a vehicle they then finalise or optimise their specs and get a testing batch made that are then tested and results put back into design changes for the serial production vehicle design. Then they make a batch for operational units to try out and use and also then they adapt the operations manual to allow for the new capabilities and features and the maintainence manual to support the vehicles. After that testing is done any changes needed are made and mass production can start.... during production changes and upgrades can be made to improve features or to just make the vehicle cheaper and easier to make. Army tests of the armored car K-53949 "Typhoon"
As reported by the press service of the Southern Military District on May 16, 2018, the newest armored car KamAZ-53949 [K-53949] "Typhoon", which was recently demonstrated at the military parade in Moscow, joined the special forces of the Southern Military District (SW). "Typhoon" has smaller dimensions in comparison with the existing technology ("Typhoon-K") and other characteristics. Inside its armored body are ten seats for the crew and the landing: four (including the commander's and driver's seats) are located face forward in the course of the movement, the remaining six are placed in the aft amphibious compartment, at the sides. The payload of the machine is 2 tons. Already this week groups of special forces will begin to master the car, conduct exercises on extreme driving in the conditions of mountain-woody terrain and impassable roads at the combined-arms range and tankodrome. A new armored car can be used to solve various tasks. First of all, it is transportation of personnel or small cargo, as well as escorting convoys. In addition, after some re-equipment, the armored car can become a sanitary, reconnaissance, command-staff vehicle. The bmpd comment. 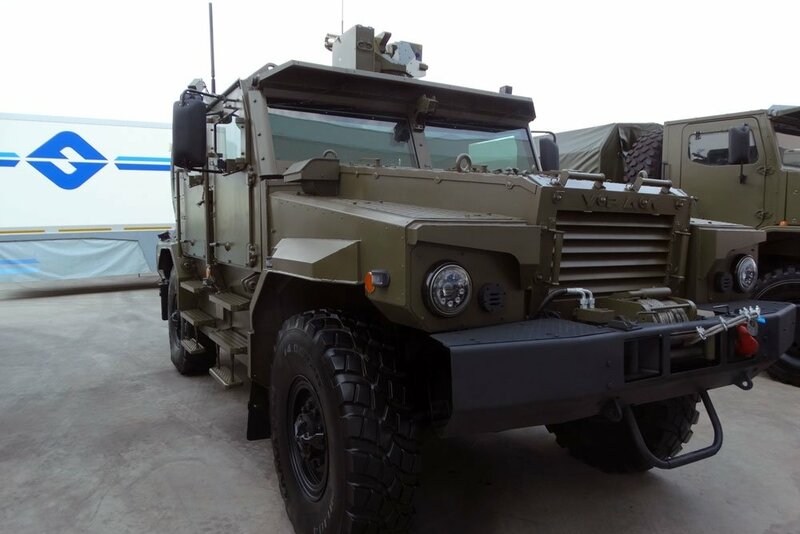 Our blog already reported on the family of protected vehicles K-53949 ("Typhoon"), work on which began at the plant "Special Car Factory" JSC "Remdizel" (Naberezhnye Chelny) in 2012. Ideologically, the K-53949 is analogous to the well-known American mass armored vehicle Oshkosh M-ATV, although it has a large capacity. The equipped weight of the armored car K-53949 is 13 tons, full - 15 tons. The capacity is 10 people. The engine power is 350 hp, the top speed is 105 km / h.
Typhoon К-63969 solid-body, 6x6 wheeled amphibious BTR (armored personnel carrier) with a remote-controlled gun. This vehicle is even more protected than the original К-63968 of which Russia has hundreds by now. К-63969 has an all-around steel+ceramic armor withstanding the 14,5 mm and 12,7 mm bullets (level 4, STANAG 4569). Mine-resistance = 3b. All family has the Russian YaMZ-530 unified engines by Yaroslavl Motor Plant. Special bulletproof glass with one of the highest level of transparency produced by the Russian company "Magistral". 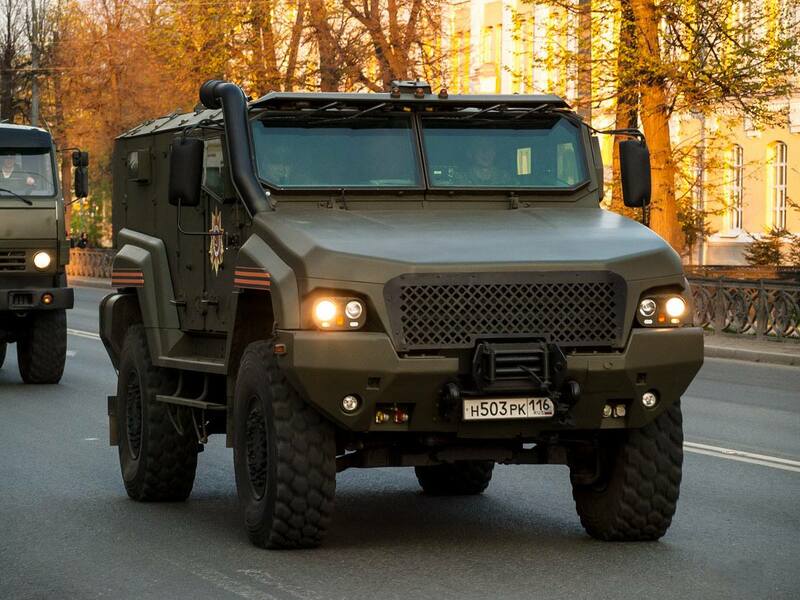 The new version of the protected car "Ural-53099"
As reported by "Rossiyskaya Gazeta" in the material of Alexei Brusilov, "New armored" Ural "was shown on the" Army-2018 ", a protected frame car with an armored single-volume body" Ural-53099 "became one of the novelties of the currently undergoing International Military Technical Forum" Army-2018 ". A four-wheel drive two-axle car from Miass, according to the developers, can be used to mount various weapons, perform tasks on the battlefield and in the rear. The all-welded body consists of a control compartment for two fighters with two side doors, as well as a six-seater compartment with two side swing doors and one door, located behind. To create a comfortable environment for the crew of the car and passengers installed heater and air conditioning. When operating in an infected area, a special filtering unit is used. With its own weight of 14500 kg, the car can carry up to 2,000 kg of cargo and tow a five-ton trailer. he car has a hydraulic winch, which has a pulling force of 8000 kg. Fuel tanks with a total capacity of 320 liters have an anti-bullet polyurethane coating, which eliminates the possibility of leakage and fire. The four-stroke diesel engine of the armored car with gas turbine supercharging has a capacity of 312 hp. The maximum speed along the highway can reach 100 km / h. Power reserve - 1000 km. 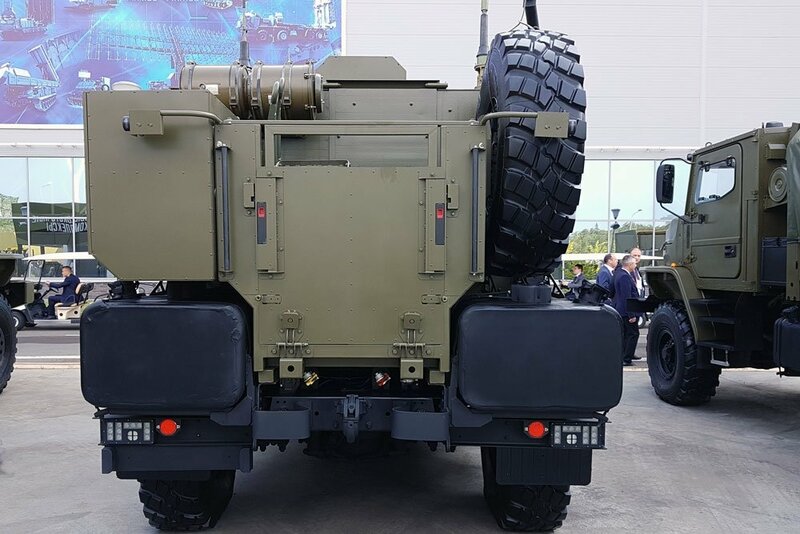 On the bmpd side, we note that the appearance of the final sample of the protected car "Ural-53099" ("Typhoon-U" 4x4) presented at the "Army-2018" has significantly changed in relation to the previously demonstrated JSC "Automobile Plant" Ural "under the same designation of the model sample. 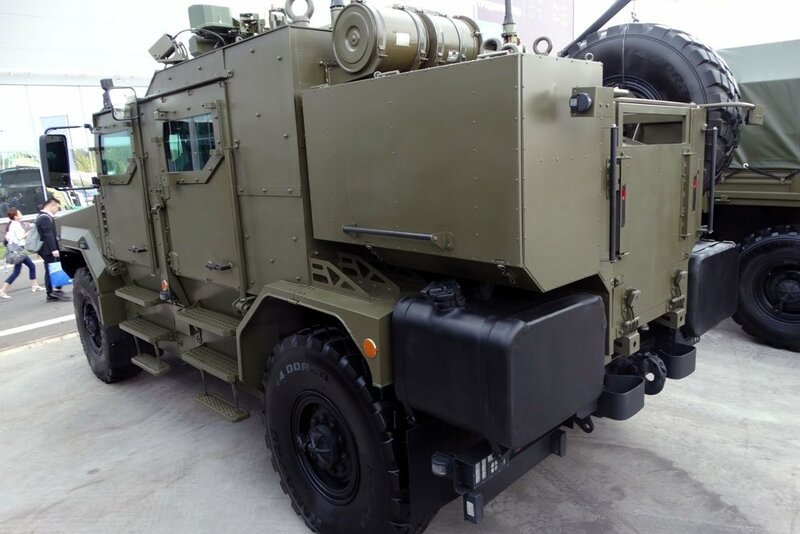 The options of the Typhoon-K 6x6 and the Typhoon-U 6x6 procured (Kamaz-63968 and Ural-63095) have bigger capacity of military personel thatn the options procured not (Kamaz-63969 and Ural-63099). All them very interesting modern options, fairly better than the BTR-80 family of infantry vehicles, now retired to export. 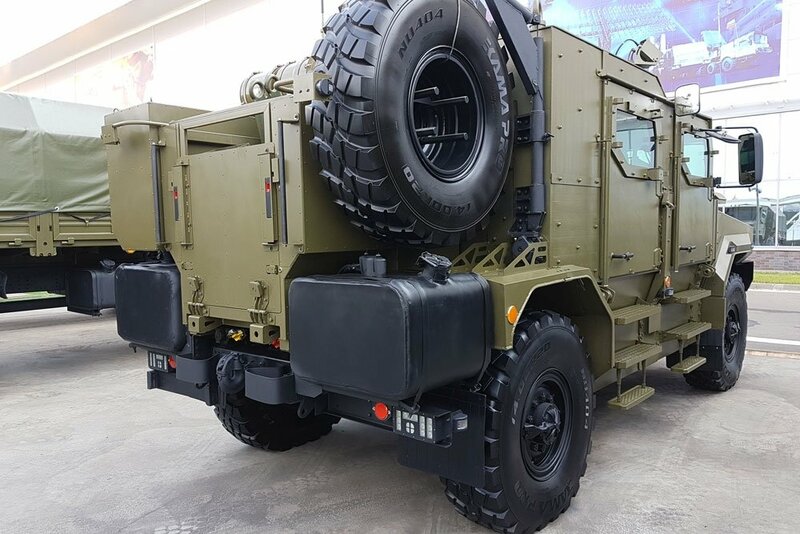 eehnie wrote: The options of the Typhoon-K 6x6 and the Typhoon-U 6x6 procured (Kamaz-63968 and Ural-63095) have bigger capacity of military personel thatn the options procured not (Kamaz-63969 and Ural-63099). Russia is still purchasing BTR-80 family. Even downgraded one for Rosgvardiya. Ok, I've seen the tests of Kamaz-63969. Looks very ergonomic and simple as it's built on a truck chasis. Wouldn't cause logistical nightmare. Looks much better for Rosgvardiya and it would leave Boomerang APC for military. The meaning of the last part of my last sentence was refering to the retirement of the BTR-80 from the catalogue of weapons to export. I do not expect new contracts of armoured vehicles of the BTR-80 family for the Russian Armed Forces. The Russian Armed Forces have now better options for procurement with the new platforms. Rossgvardiya, as non military security force has different standards.